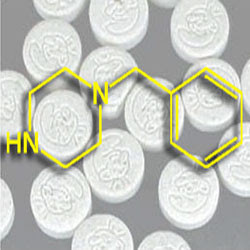 Scientists at Anglia Ruskin University haves shown that one of the most common 'legal high' designer drugs, benzylpiperazine, is not only dangerous when it's taken - repeated consumption poses major health risks. Cole's group, in conjunction with his colleague Lata Gautam, made a number of batches of BZP under different conditions to manipulate the proportions of the impurities. They then tested them against several human cell lines - fibroblasts, liver and kidney cells - both singly and as mixtures. They found that BZP is toxic to the kidney, while the precursor piperazine is toxic to the liver. The impurities are even more harmful and have synergistic effects with BZP itself. 'The damage you see is greater than the sum of the parts,' he says. 'If people suspected to have taken these drugs end up in hospital, medics should do liver and kidney function tests, as it's not always immediately apparent that damage has occurred,' he says. The research was presented at the annual meeting of the American Academy of Forensic Sciences. According to Ric Treble, scientific advisor at LGC, the number of these 'legal high' drugs is increasing rapidly. 'I believe 41 new compounds were identified last year,' he says. 'They are often sold as "research chemicals" and there is very little information about their short or long term effects. According to David Nichols, professor of pharmacology at Purdue University, people make and try new ones, and then post information about them on blogs.